Good morning my friends, well, it was a FALSE ALARM, Stephanie is still waiting and so are we, the baby didn’t come last night. Ahhh… It won’t be long though! You know that WAITING on something helps us to learn to be PATIENT. 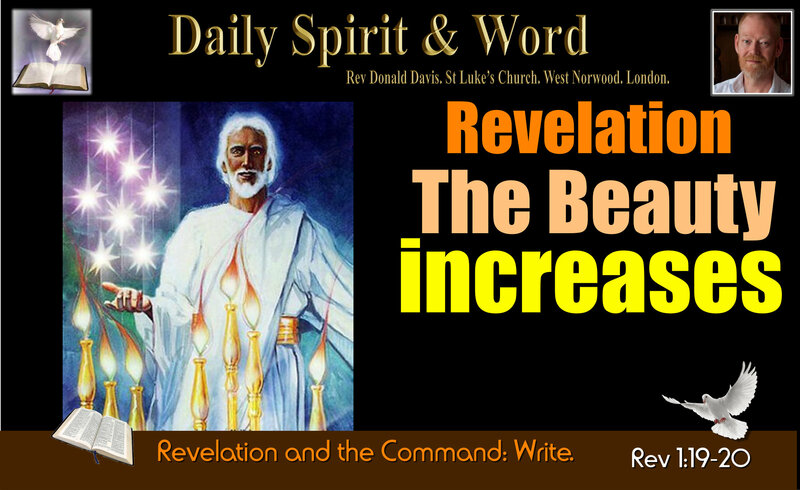 Today we’re back with Revelation and John is describing the Vision that he had of Jesus. The words that John used to describe his vision of Jesus reveal that Lord in Heaven looks like: A King in Splendour, A High Priest and A Judge. 13 and among the lampstands was someone “like a son of man”, dressed in a robe reaching down to his feet and with a golden sash round his chest. When John, who was “In The Spirit” heard the thunderous / trumpet like sound, he’s telling us what we’d all instinctively do; He turned to see who it was that was speaking so loudly. This is reminiscent of the rumbling thunderous sound that Moses and the People of Israel heard when the Lord was on the Mountain and Moses ascended to receive the Ten Commandments. Of course we know it was the SAME voice speaking. In contrast it’s different from the “Small Quiet Voice” King David heard. The Seven Golden Lampstands: Remind us of the Tabernacle with it’s golden lampstand and Seven lamps that were meant to be lit every day by the Priest. Here in Revelation we’ll see that they represent Seven Churches, but even those churches are representative of every Church / Christian down through the ages. (See Also: Exodus 25:31-32, 37). You’ll note that the Lampstand in the Tabernacle on Earth was just one with seven lamps on top, this lampstand represented the Unity of the Tribes of Israel. However, in Heaven they are individual Lampstands and they represent Churches in Heaven. We are to keep shining our light for Jesus Christ in this world, our light is shining in Heaven too. The Son of Man: “Someone “Like A SON of Man””… We know from both the Old Testament and Jesus own revelation in the Gospels that this is Jesus. He was God whilst he was on the Earth, but He looked just like everybody else, like the son of an ordinary man. i.e. John is telling us, though He looked like a human being, there was something very different about Him. We’ll see that too, because how many ordinary men do you see carrying Stars in their hands or having a sword coming out of their mouth and feet like molten hot metal or a face as bright as the sun in all it’s brilliance? Ezekiel 1:26 and Daniel 7:31. However, Jesus is in Heaven just like a human being. He’s like us but very different. He’s the same Jesus who walked and talked and touched unclean people to make them whole again. He’s the same Jesus who’s hands were pierced by nails. However, we’re going to see He’s also very different in Heaven. The Dress of the Son of Man: “dressed in a robe reaching down to his feet and with a golden sash round his chest.” Who else do we know who dresses like that? Of course it’s the High Priest and Kings. The Golden Sash is like the Priest’s Girdle which was worn high and under his breast. The Gold represents Royalty. Jesus is not just sitting on a Throne in Heaven: He’s our Great Hight Priest and Our Advocate (Lawyer) with the Father (1 John 2:1) I read somewhere that, “In Heaven Jesus is doing more for us every day, than He did for us upon the Cross” I know that sounds strange, but Jesus is continually coming before the Father on your behalf. He’s the High Priest and His Sacrifice upon the Cross is a constant reminder in Heaven that He paid the price of all your sins. Now He pleads your cause with the Father. That’s how we can approach the Throne with boldness, we’re completely covered in the Righteousness of Christ. White Hair and Blazing Eyes: Those eyes sound so scary don’t they. I’ve seen movies with creatures with blazing eyes, but the LORD’S blazing eyes are eyes that can SEE everything. He knows everything. His Holy Eyes are on FIRE. NOTE: John is describing the whole person: His clothes, His movement (Amongst the Golden Lampstands) What Jesus is holding: Stars (He’s the Creator of the Universe and holds all things and keeps all things. Jesus continually keeps Creation in check. His maintenance of His Creation is continual). He describes his face, his hair, his eyes, his mouth… WOWzer! John wants you and me to know EXACTLY what he saw, and was instructed by the Lord Jesus Christ to write it down. 17 When I saw him, I fell at his feet as though dead. Then he placed his right hand on me and said: “Do not be afraid. I am the First and the Last. 18 I am the Living One; I was dead, and behold I am alive for ever and ever! And I hold the keys of death and Hades. WOWzer again! 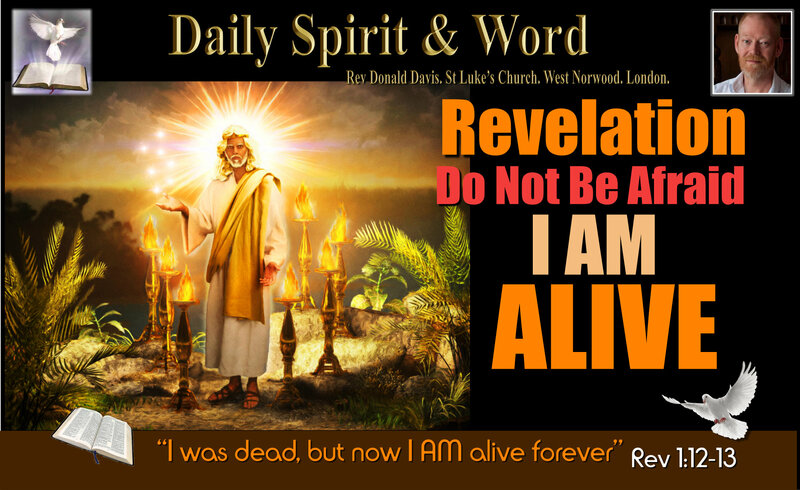 Jesus is ALIVE in Heaven: He’s not some ghost or spectre, He really is LIVING, ALIVE and today people on the Earth can truly know and experience the Living Christ. It was awesome the first time I knew that Jesus was alive. It was before I was a Christian, before I ever submitted to Him as my Lord. It was 1984, I’d been attending church in order to get my child baptised. I didn’t want anything for myself, but if this God was real, I wanted the best for my child. I was shocked, frightened and startled to discover that Jesus Christ really is ALIVE and Knows all about me. I knew Jesus was alive, but it took me a long while to come to Him in Faith and Repentance and to receive Him as Lord of my life. It took about a month after my first revelation, but I knew Jesus was alive. When I received Him as my Lord, I was in no doubt whatsoever what I was doing. Peace and Joy flooded my being, when Jesus was in me, it was as if the whole earth had been renewed. I saw things in a very different way and appreciated the smell of wet mud, it was beautiful to me. My friends, do you know that becoming a Christian today, as it has always been, is not about coming to church, getting baptised etc, it’s all about coming to Jesus Christ. Knowing that He’s alive and submitting to Him as Lord of your life. Then going to church will be your delight. Missing church is a heartache for someone who really KNOWS Jesus. Because, we KNOW that when we gather together with other brothers and sisters in God’s Family, Christ Jesus Himself comes into our midst in wonderful ways. When you KNOW HIM, you are in Him and He’s in you. So don’t get religious get Jesus. Turn now in repentance and faith and trust Jesus as your Saviour today. P.S. I’m singing this great old Hymn now. It’s one that’s touched my life so many times. It’s OLD but brilliant. He LIVES: “I Serve A Risen Saviour”.